Sharing 1,933 miles of border with the United States, Mexico is a foreign policy concern for the US government based on its sheer size and proximity. Mexico is also a crucial trading partner with the US. In 2012, U.S. exports to Mexico accounted for 14 percent of overall U.S. exports and Mexico was the United States' third largest supplier of goods imports. According to the US Census Bureau, in 2012 Mexican-Americans accounted for nearly 11 percent of the US population. 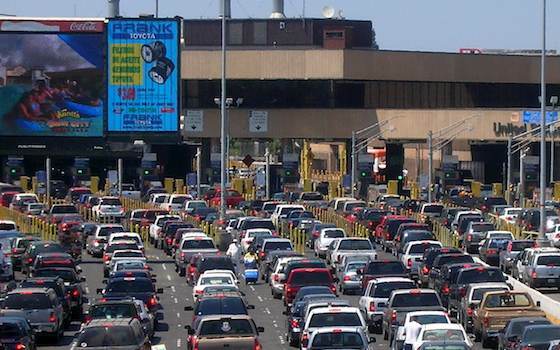 The US-Mexico border has more people cross it annually than any other border in the world. Given so many significant relationships, the strategic implications of Mexico's security and stability are inherently obvious. Yet the US is inexplicably passive in regard to an enormous problem sitting right on its doorstep: the violence and growing power of Mexican drug cartels. Since 2006, more than 60,000 people have been killed in Mexico at the hands of drug trafficking organizations . That's a number greater than the KIAs the US suffered in Vietnam. Drug trafficking organizations control vast areas of Mexico, using violence as a bartering tool and bribing authorities at all levels of the government. "Barbarous murders, military-like firefights, rampant corruption, a traumatized citizenry, and high-stakes political gamesmanship frame Mexico's ongoing challenges." Given the enormous number of Mexican immigrants in the US, it may only be a matter of time before US law enforcement, rather than Mexican law enforcement, is at war with the narco-kings of Mexico. Based on the foregoing, the US must begin a serious dialogue with the Mexican government to propose long-term solutions to the grave situation in which the police and military forces as well as the people of Mexico find themselves. The US can begin to analyze the Mexican problem by examining Plan Colombia which, although encompassing a vast myriad of political, economic, and military goals, significantly reduced violence in that troubled country. Plan Colombia, crafted in 1999, was America's primary instrument for providing aid to the government of Colombia. It focused primarily on the provision of military and law enforcement assistance, but it has furnished other kinds of aid as well. At the same time, as Colombia has become less of an American focus, Mexico is becoming an unavoidable concern because of the high rate of lawlessness and conflict occurring in the US's own"backyard." Given its long and costly involvement in Colombia, the question necessarily follows: How can the US most effectively apply lessons learned from the execution of Plan Colombia to support the Government of Mexico's (GOM) efforts to curb violence in Mexico? Most Americans are vaguely aware that Mexico is currently a violent place. US policy makers are somewhat more aware, yet they have done little to address the problem. Lamentably, even fewer Americans are aware of why Mexico is violent and more importantly for the US, what that could spell for American interests. During the third presidential debate between Mitt Romney and Barack Obama in October 2012, Latin America, incredibly, was mentioned only once and Mexico was never specifically mentioned. This left many in Latin America dumbfounded. "As [former President] George W. Bush rightly said, Mexico is the US's most important bilateral relationship. A presidential debate should focus on whether the United States is doing enough --and doing the right things -- to assist Mexico [and Central America] deal with its drug-fueled crime and violence," said Michael Shifter, president of the Inter-American Dialogue. Shifter continued,"If the US is not prepared to do everything possible to stand up for its closest neighbors and allies, then how could it have a credible foreign policy more broadly?" An even more pressing question should be asked: If the US is not prepared to do everything possible to prevent Mexico from becoming a war-torn, criminal-controlled, perhaps failed state, what internal threats to law and order will the US soon be scrambling to control within its own borders? Understanding complex drug trafficking organizations (DTOs) requires understanding the landscape that fostered their rise. The details and historical legacies that make Mexico a corrupt state are beyond the scope of this study, but Mexican corruption is undeniably a major underlying cause of the operational freedom the cartels now enjoy. In"Drug Lords and Narco-Corruption: The Players Change but the Game Continues", Peter A. Lupsha observes,"It is impossible to identify a beginning date for corruption Mexico, for it is as eternal as the Aztec sun." That was written in 1991, long before the cartels possessed the kind of power they hold today. Turn the clock forward twenty-three years to 2014 and, for Mexicans, it now is necessary to cooperate with the drug lords or risk a violent death. The institutional infection of corruption penetrates every level of government in Mexico. Any noticeable reform can be expected to take many years, perhaps decades. Defeating the lawless plague that has engulfed Mexico will cost the lives of drug traffickers, Mexican government officials, and most regrettably, innocent Mexican citizens. The US cooperated with several Latin American countries at an earlier point on the issue of drugs as part of its broader"War on Drugs." While the problems in Mexico run much deeper than drugs, past joint operations can offer starting points and partial solutions to initial concerns before engaging with Mexico. The most extensive of these operations, widely referred to as Plan Colombia, was directed against the Fuerzas Armadas Revolucionarias de Colombia (FARC) insurgency and cocaine production/trafficking. Although American involvement there is fading, Colombia was the major recipient of US assistance to Latin America during the War on Drugs and thus offers the best model to future American undertakings south of the border. Although this paper will address possible solutions to Mexican instability caused by the cartels, the proposed solutions will involve mostly Mexican actions based on Plan Colombia. This study will not, however, examine every aspect of Plan Colombia. Instead the paper will closely examine just two main positive aspects of Plan Colombia which can serve to inform a US policy for assisting Mexico. Thus, drawing on the US experience with Plan Colombia, the present study will focus on the success of the clear-hold-build strategy as it pertains to special operations and the procurement of useful equipment for fighting counterinsurgency to include helicopters, drones, and signals intelligence. This study will argue the US currently lacks a coherent strategy for strengthening the GOM's ability to combat DTOs operating within its borders. Washington is vaguely aware of the various elements of the drug trade and their plausible effects on the US, but little is being done to bring down the larger machine that keeps the wheels turning. "Although the U.S. government is currently implementing measures to address the separate pieces of this problem -- for example, deploying National Guard units to the border -- it has yet to craft a truly comprehensive domestic and foreign strategy to confront the inter-related challenges of trafficking and violence reaching from the Andean Ridge to American streets." Currently, the Mérida Initiative is the only major American response to the violence in Mexico. The Mérida Initiative is a partnership between the United States and Mexico to fight organized crime and associated violence while furthering respect for human rights and the rule of law. Given the current levels of violence and influence of the cartels, the Mérida Initiative is not enough. Furthermore, its provisions are very shallow and unambitious given the array of issues facing the GOM. Mexico continues to spiral downward as drug-related conflicts engulf large parts of the nation. More promising alternatives for Mexican security challenges as they affect American interests may be gleaned from a number of lessons learned from Plan Colombia. These concepts can be modified for the Mexican situation, but Plan Colombia offers more than positive experiences. Among the"lessons learned" associated with Plan Colombia are key failures that must not be repeated in Mexico. But in spite of these shortcomings, Plan Colombia in the main represents a model of a successful counterinsurgency effort in Latin America and of effective cooperation and training between American military/police forces and those of the host nation. The replication of Plan Colombia's development of robust special operations capabilities and military aid programs to provide Mexican security forces with enhanced intelligence, surveillance, and reconnaissance (ISR) capabilities can lay the foundation for a more secure Mexico. Specifically, the special operations capabilities of the Colombian military and police coupled with American technology and hardware enhanced Colombia's COIN ability. The history of Plan Colombia must be understood before applying lessons learned from its execution to the contemporary situation in Mexico. Plan Colombia was initiated in 2000. The US government at that time identified the pressing issues facing the Colombian government as follows: promoting the peace process between the FARC and the Colombian government, combating the narcotics industry, reviving the Colombian economy, and strengthening the democratic pillars of Colombian society. While Plan Colombia included a wide array of initiatives aimed at assisting the Colombian government, its main focus was military assistance and money to combat drug trafficking in the region. This is one reason it is applicable in Mexico: both countries have had to face DTOs whose power has grown so immense that they threaten national security. But Plan Colombia represented a choice. In contrast, the US has no option but to become involved with the drug war in Mexico, because Mexican violence has already begun to spill over the border. Mexican cartels also have a significant presence in major US cities, making the power, money, and ruthlessness of Mexican cartels a threat to many US neighborhoods. Thanks to the strengthened capacity of Colombia's security forces and vastly improved intelligence capabilities, kidnappings declined between 2002 and 2009, from nearly 3,000 to just over 200 annually, and killings were reduced by nearly half in the same period ….By heading off what seemed to be the collapse of the Colombian state, and avoiding the ensuing chaos and uncontrolled violence, U.S. foreign policy furthered its goals in the hemisphere of protecting democracy and defending human lives. Plan Colombia's main successes that could be adapted for Mexico include the special operations capability that helped foster its population-centric counterinsurgency (COIN) component and the associated military training and financial aid programs. More specifically, the outcome achieved in Colombia illustrates a successful execution of the clear-hold-build strategy with American training and financial aid playing important support roles. In Mexico, this aid must take the form of ISR platforms giving the GOM better intelligence and increased situational awareness. No less important, in the end, it was the Colombians who were cleaning up their own country, not the"gringo imperialists". In the case of Mexico, forcing the cartels to become increasingly cautious due to the pressure applied by special operations raids, constant monitoring by drones and other ISR platforms, all used as part of a nation-wide COIN campaign will severely limit their freedom of operations and eventually dent their checkbooks. The first step to resolving a problem is admitting that a problem exists. American policy makers are increasingly aware of the violence in Mexico. The real difficulty here is that no one seems to understand its significance or how to stop it. The US must also take care not to misdiagnose what is occurring in Mexico. The cartels are not a united band of thugs against which conventional military force can be employed. What makes the diverse and fractious Mexican cartels tick is simple: el dinero. Logically, cutting off the drugs that produce the cartels' profits would cripple them. Unbeknownst to many, the cartels can turn a profit moving things other than drugs. They are logistical experts. Cartels can turn a profit moving humans, guns, and anything else illegal that isn't a drug. This is why the decades-old drug war strategies employed by the US in Latin America must be re-assessed in the case of Mexico. Drugs are the DTO's most profitable venture, but the vast territories they control in Mexico allow them to exploit the government, private businesses, and nearly anyone wanting to survive within territories under their control. In effect, the cartels can be seen as insurgents pushing not a political agenda, but a financial one. Thus, in the opinion of US Army Major Christopher Martinez, Mexico currently has a"commercial insurgency" on its hands. Both the American, and especially the Mexican governments, must recognize the implications of such an insurgency before they jointly implement a strategy to combat the cartels. Specifically, the power, wealth, and vast reach of the cartels must be realistically assessed as well as how the cartels maintain those strengths. Acceptance of the Mexican situation as more than junkies and thugs south of the border, something more than a Mexican problem, and indeed, defining the cartels' activities as constituting an insurgency is critical to moving forward. Major Martinez puts it this way,"As history has shown, counterinsurgencies become long wars when nations fail to recognize the onset of an insurgency or apply conventional tactics in ﬁghting it. The US and Mexico can avoid this trap if they develop a strategic plan that acknowledges transnational criminal organizations (TCOs) for what they are, commercial insurgencies." After more than a decade of limited results in Afghanistan and a hellish experience in Iraq, the writing on the wall for the American public seems clear: the best way to win counterinsurgencies is to not fight them. The only COIN campaigns that seem absolutely necessary are those that exist inside one's own country. Mexico's commercial insurgency does indeed rest within its borders and the power of the cartels constantly expands. The nature of cartel operations in Mexico differs from illegal drug operations in the US where drug dealers operate largely under the radar to avoid arrest. Mexican cartels have been able to clear entire towns in order to support their operations. Mexico has no choice but to begin reclaiming the country and establish order. Indeed, a clear-hold-build type COIN campaign is what is required. The clear-hold-build strategy employed in COIN operations as part of Plan Colombia can be modified for application in Mexico. Colombia offers a viable blueprint that, with proper adjustments, could offer a way ahead for Mexico and ultimately for the US. The clear-hold-build strategy is a basic COIN strategy in which the counterinsurgents try to: (1) clear the area by destroying, capturing, or forcing the withdrawal of insurgent combatants, (2) hold the area with security forces, ideally host nation (HN) forces, in order to effectively reestablish a HN government presence at the local level, and (3) build support for the HN government by protecting the populace and improving economic, social, cultural, and medical needs. It was fulfillment of those three objectives that led to military success in Colombia. And it is Colombia that must be used as a blueprint for Mexico to begin clearing that nation of cartels. "For those who insist that the U.S. must fight and win counterinsurgency wars around the globe, Plan Colombia provides the most plausible -- and perhaps the only -- example of the efficacy of the clear-hold-build sequence." While Plan Colombia did not end the Colombian Civil War outright, it helped decimate the ranks of the FARC. The Colombian government currently estimates the FARC to have 7,168 members, down from 20,766 in 2002. Thus, a recent Colombian government-sponsored study concluded that"the main concern of the FARC is the preservation of the force." The same could be said for the cartels in Mexico. While profit is their main center of gravity, it is membership and manpower that drives this profit. De-incentivizing cartel membership via stronger security and reliable government forces will force drug lords to try and do more with less as well as isolate them amid a dwindling number of followers. Special operations were a center of gravity in the military aspect of Plan Colombia. They were crucial as part of the military and police efforts to eliminate the FARC. This success encourages the application of special operations against the cartels with the US playing a similar role. According to New York Times reporter, Mackenzie Eaglen,"Under Plan Colombia, American aid and advisers, mostly special operations forces, helped Colombian security forces fight FARC rebels and their drug trafficking allies. Colombia was able to recover and today stands as one of Latin America's most influential success stories." The US was able to successfully train Colombian special operations forces to conduct the campaign themselves in 2000. Now, in 2014, the American special operations machine arguably is even more capable than in 2000. Counterterrorism and COIN experiences in the Middle East and Southwest Asia have sharpened the skills of American special operators and would enable them to train Mexican special operations to an even higher degree of proficiency than was achieved in Colombia. Furthermore, Colombian special operations, independently effective in their own right, could be used to train security forces in Mexico, leaving the US to play largely an advisory role. This would leverage the shared language of Colombia and Mexico and further reduce the American footprint, an encouraging development to any Mexicans who still view the Mexican-American War as a"US Invasion." The Colombians have already demonstrated their proficiency on a number of occasions such as when they rescued three American contractors in 2008, as described by Linda Robinson:"In 2008, after a prolonged manhunt across the country's southern wilderness, Colombian commandos rescued three American contractors who were being held hostage by FARC guerrillas. U.S. technology and training helped, but it was the Colombians who devised and carried out an elaborate deception operation that rescued the hostages. The achievement served as a very public demonstration that Colombia's special operators were ready for prime time." What the US needs to help protect its borders is for Mexican special operations to be ready for"prime time". The development of Mexican special operations capability will be neither easy nor rapid. However, the potential dividends cannot be understated. The US now conducts small-unit raids and manhunting operations with relative frequency and generally positive results. Most notably, the 2011 mission that killed Osama bin Laden illustrated just how far US special operations forces have come. The lengthy nature of the training process must not dissuade the ever-impatient American public and government from beginning to invest in the capability of Mexican special operations forces, drawn from both its military and civilian police. The longer the US waits to begin to employ such a strategy, the more challenging and bloody the situation future Mexican special operators will have to face, making the eventual US involvement more desperate and costly. A large part of the US contribution to Mexico's COIN campaign will be military aid, equipment, and training. The US must be willing to foot the bill for some of Mexico's security investments. Sales and aid packages and ISR platforms such as drones and electronic surveillance will be critical. Drones such as the MQ-9 Reaper and RQ-170 Global Hawk will provide Mexican security forces with live actionable intelligence and greater strike capability. Because this is a Mexican campaign, the Mexicans will need to provide an accurate analysis of the platforms, training, and other tactical assets they require. ISR capabilities, specifically drones and signals intelligence capability, will greatly bolster the GOM's fight against the cartels. With listening technology and a heavy presence of drones, Mexican forces will be able to constantly monitor suspected cartel members and strike them if necessary. Furthermore, this pressure will force cartels to be more creative and take fewer risks, to include moving less frequently, communicating less via email and cell phones, and ultimately reducing the amount of product they move. Over twenty years ago, for example, US technology proved decisive in the capture and later killing of Colombian drug lord and one of the richest men in the world, Pablo Escobar, in 1993. A highly secretive intelligence gathering unit from the US Army known as"Centra Spike" used radio triangulation technology to assist Colombian forces in pinpointing Escobar's location. The intelligence they gathered was passed along to Colombians who then acted on it with kinetic strikes. It was crucial in dismantling Escobar's network. Such a relationship between American and Mexican forces could be an excellent starting point for a partnership against DTOs. More recently and under the auspices of Plan Colombia, a National Security Agency (NSA) eavesdropping package significantly bolstered Colombian commandos' situational awareness and intelligence in prosecuting FARC targets:"Most every operation relied heavily on NSA signal intercepts, which fed intelligence to troops on the ground or pilots before and during an operation. 'Intercepts . . . were a game changer,' said [William] Scoggins [counternarcotics program manager at the U.S. military's Southern Command], of U.S. Southern Command." The NSA can play a similar role in Mexico, using its unmatched signals intelligence capabilities to listen to communications between suspected targets. Drones, such as the aforementioned MQ-9 Predator, could then follow the target for as long as is deemed necessary. The Predator also possesses the ability to launch missiles, killing any targets that cannot be allowed to escape. The employment of American drones in the sky, operating under Mexican instructions, would be much more politically feasible than American boots on the ground. However, the eventual goal should be the independent operation by Mexico of American-built drones. Such operations with drones have proven to be an excellent complement to special operations both in Iraq and Afghanistan. As both Mexican special operations capabilities and drone coordination evolve, combining command and control and increasing the speed with which Mexican personnel can act, the cartels would find themselves subjected to a growing amount of pressure. The real-time intelligence provided by drones allows special operations to rapidly deploy and strike time-sensitive targets. This combination of communication interception by the NSA, constant monitoring and reconnaissance by drones, and rapid strikes by special operators would serve as the opening round of what can be expected to be a longer war waged by Mexico and the US against DTOs. Turning back to Colombia, although the FARC's military capability was crippled, cocaine production there was not. Furthermore, as discussed earlier, profit-minded drug lords move more than narcotics. In Colombia, it was military action and profit depletion that deal the biggest blows to the FARC. The RAND Corporation reached a similar conclusion:"In Colombia, strategic cooperation and large amounts of U.S. aid failed to stem the production of narcotics. Nearly two-thirds of global cocaine continues to be produced in Colombia. Yet it is undeniable that Plan Colombia, an eight-year strategic initiative providing $6 billion in U.S. aid, succeeded in depriving the FARC rebels of drug profits by strengthening the Colombian military and police to target violent traffickers." Simple economic analysis shows that declining profits, combined with rising risks of operation would disrupt the cartels' current business model. "This paper has argued that at an astonishing cost in human lives and livelihoods, counterinsurgency has worked in Colombia and will not anywhere else for several reasons. First, the FARC never represented more than a fraction of the peasantry -- settlers on the southeastern agrarian frontier -- much less the urban working class or fractions of the middle class. They never formed a viable pole of leftist nationalism, andwere encircled by the new right under Uribe. Second, U.S. soldiers never fought and died in Colombia, and the Colombian armed forces have grown enormously whenever the U.S. government has focused on counterinsurgency, as in the 1960s and the 2000s." While Plan Colombia did cost many lives, it is certainly arguable that it was worth the cost, given current levels of relative stability. Insurgencies that are allowed to fester before being confronted will always cost more blood and treasure for the host nation to defeat. The alternative is to let the cartels rule. That is why Mexico and the US must act now. The social differences that Hylton mentions are not applicable to Mexico, which is why this paper has avoided conflating the FARC and Mexican cartels as similar organizations or as having similar goals. Their differences in modus operandi and organizational objectives must be understood. Hylton's second claim seems to assume that most nations are not capable of waging COIN on their own, which is a hasty assertion. Although the US should not participate in direct action against the cartels in Mexico, it can supply aid, training, and technology much in the same way it did in Colombia, which facilitated indigenous forces to accomplish their goals. This study has largely ignored the issue that has helped foster the plummet of Mexican national security: corruption. Sustainability of any of the aforementioned objectives will depend on a credible Mexican government that is sufficiently free from corruption to make lasting gains against the cartels. Corruption is the biggest hindrance to a functional Mexican police force and military. Many of the dedicated lawmen and soldiers of Mexico cannot perform their jobs due to corrupt commanders. Furthermore, these Mexican patriots are afraid to speak out against corruption and cartel influence because doing so can amount to a death sentence for them and/or their loved ones. It could be legislation and politics that end up being the decisive factor in this conflict. This subject merits painstakingly detailed research and attention in identifying the way forward for a stable Mexican state. Corruption is undoubtedly the biggest and most complex problem plaguing Mexican and American security. The importance of Mexican security to the US cannot be understated. Nor can the dire situation in which the GOM and its people find themselves. The deteriorating situation demands bilateral action. Plan Colombia offers the rough draft. Despite its flaws, Plan Colombia demonstrates that the US can defeat insurgencies hostile to its interests without American boots on the ground. Such a campaign in Mexico would rely on the replication of the rapid increase in proficiency of Colombian special operations forces. With Americans advising and teaching, Mexico must create a robust special operations capability to start dismantling Mexican DTOs. US officials would also be wise to have the US act as a facilitator for Colombian special operations forces to whom would fall the task of training their Mexican counterparts, allowing the US to maintain a politically advisable low profile. Mexican commandos on par with US and Colombian operators would be a significant hindrance to the cartels, forcing them to change how they conduct all aspects of their operations. The presence of a highly trained force of indigenous operators could also foster the conditions for a nation-wide COIN campaign to clear cartel-controlled areas. These commandos cannot act without solid intelligence. Again, the US must assist. Working with the NSA to monitor communications among the cartels, the GOM must focus all of its available resources on listening to what the DTOs are saying, especially through electronic means. Similar to how the FARC was undone in Colombia, greater intelligence will allow accurate raids and drone strikes against the cartels. Furthermore, the GOM must be able to locate and engage DTOs in conjunction with special operations raids. American drones will play a critical role here, until Mexican forces can conduct these operations independently. The US must provide the platforms and training necessary for the GOM to develop these capabilities in the form of advisory roles and military aid packages. With a robust ISR capability, the Mexican military and police forces will be able to gather more actionable intelligence and act on it quickly. Law and order in Mexico has already been severely compromised and the freedom of her people is at stake. In an era where the US fears the plethora of dilemmas associated with political instability, it needs only look across its own border to see the most menacing of such threats. As DTOs take an increasing amount of territory and lives, the lawless conditions in Mexico will become an increasing threat to American national security. Plan Colombia can serve as an initial blueprint for addressing that threat, as restricting the reach of the drug cartels becomes just a Mexican problem. Further research should be accomplished on what a hemisphere-wide campaign against DTOs would look like. The Center for a New American Security (CNAS) has already released a policy brief that addresses that question and recommends:"The United States should respond by integrating its counternarcotics and security assistance, operations, and, as appropriate, intelligence efforts throughout the region into a single, streamlined strategy. "[xxiii] The US would be wise to spearhead an effort that united all of Latin America to crush the DTOs plaguing the region by focusing on each nation's specific problems, such as the enormous drug market within the US. This paper has argued that, drawing from Plan Colombia, special operations must be trained and employed in Mexico as the beginning of a long term reconstruction of the country. Office of the United States Trade Representative. US-Mexico Trade Facts. Executive Office of the President, 2013, http://www.ustr.gov/countries-regions/americas/mexico (accessed February 23, 2014). Evelyn Krache Morris. "Think Again: Mexican Drug Cartels," Foreign Policy, December 3, 2013, http://www.foreignpolicy.com/articles/2013/12/03/think_again_mexican_drug_cartels (accessed January 14, 2014). Ray Walser, 'U.S. Strategy Against Mexican Drug Cartels: Flawed and Uncertain,' The Heritage Foundation. April 26 2010, http://www.heritage.org/research/reports/2010/04/us-strategy-against-mexican-drug-cartels-flawed-and-uncertain (accessed October 10, 2012). Sara Miller Llana,"With 60,000 dead, Mexicans wonder why drug war doesn't rate in presidential debate," The Christian Science Monitor, October 23, 2012, http://www.csmonitor.com/World/Americas/2012/1023/With-60-000-dead-Mexicans-wonder-why-drug-war-doesn-t-rate-in-presidential-debate (accessed February 23, 2014). Peter A. Lupsha, 'Drug Lords and Narco-Corruption: The Players Change but the Game Continues,' Crime, Law and Social Change 16, no. 1 (1991): 41. The"War on Drugs" refers to the general effort of the American government to halt the drug trade. For the purposes of this paper, it refers only to efforts occurring within Latin America. Bob Killebrew and Jennifer Bernal, 'Crime Wars: Gangs, Cartels and U.S. National Security,' Center for a New American Security, September 2010. "Merida Initiative," US Department of State (Washington D.C.) http://www.state.gov/j/inl/merida/ (accessed November 14, 2012). Bureau of Western Hemisphere Affairs, 'United States Support For Colombia,' US Department of State, March 28, 2000, http://www.state.gov/www/regions/wha/colombia/fs_000328_plancolombia.html (accessed September 25, 2012). FM 3-24, Counterinsurgency (Washington D.C.: Headquarters Department of the Army, 2006): 5-51 – 5-78. Hylton, 'Plan Colombia: The Measure of Success,' 12. Juan Guillermo Mercado,"Desmovilización, principal arma contra las guerrillas," El Tiempo, September 22, 2013, http://www.eltiempo.com/justicia/desmovilizacion-principal-arma-contra-las-guerrillas_13077339-4 (accessed March 8, 2014). Mackenzie Eaglen,"Green Berets' Value Is Proven in War on Drugs," New York Times, September 5, 2012, http://www.nytimes.com/roomfordebate/2012/05/08/should-us-troops-fight-the-war-on-drugs/green-berets-value-is-proven-in-war-on-drugs (accessed April 22, 2014). Many Mexicans contend today that the Mexican-American War of 1848 was not a war with equally culpable participants, but an American invasion aimed at seizing territory. Robinson,"The Future of Special Operations: Beyond Kill and Capture." Mark Bowden, Killing Pablo: The Hunt for the World's Greatest Outlaw (New York: Penguin, 2002). Dana Priest,"Covert action in Colombia," The Washington Post, December 21, 2013, http://www.washingtonpost.com/sf/investigative/2013/12/21/covert-action-... (accessed May 4, 2014). Benjamin Bahney and Agnes Gereben Schaefer,"Assessing Mexico's Narco-Violence," The San Diego Union-Tribune, May 14, 2009. Killebrew and Irvine,"Security Through Partnership: Fighting Transnational Cartels in the Western Hemisphere." "More Than a Mexican Problem"